The MTV VMAs are upon us! What cultural embarrassment will they unleash on unsuspecting music fans this year? Who will awkwardly lip sync and gyrate to forgettable pop songs this time around? All kidding aside, there's a lot to look forward to this year—Beyonce is apparently going to sing every single song she's ever sung in her life and even Taylor Swift's cat is getting excited about the whole thing. Additionally, Iggy Azalea, Usher, Maroon 5 and Nicki Minaj are all scheduled to take the stage (Minaj will open the show with Jessie J and Ariana Grande). 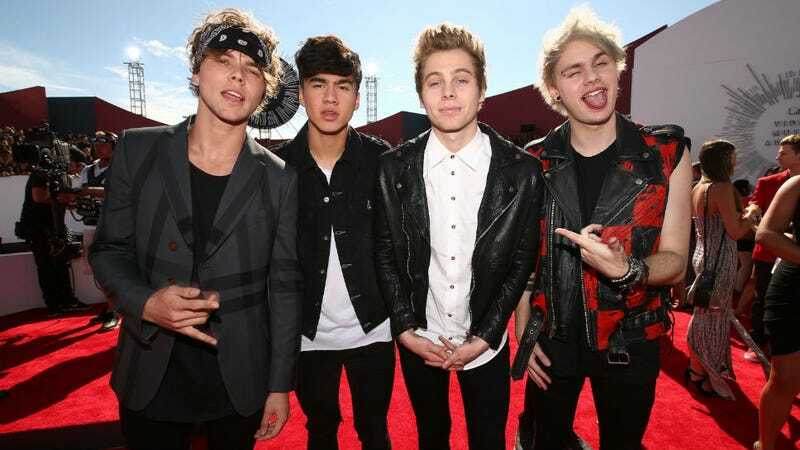 Jezebel hero band 5 Seconds of Summer are also set to perform. Make sure to join us here tonight to follow everything that happens. David Guetta ft. Mikky Ekko – "One Voice"
Ed Sheeran ft. Pharrell Williams – "Sing"